Update: October 2016 – Please note that our Google Fit connection is being deprecated due to a lack of developer support for the product. 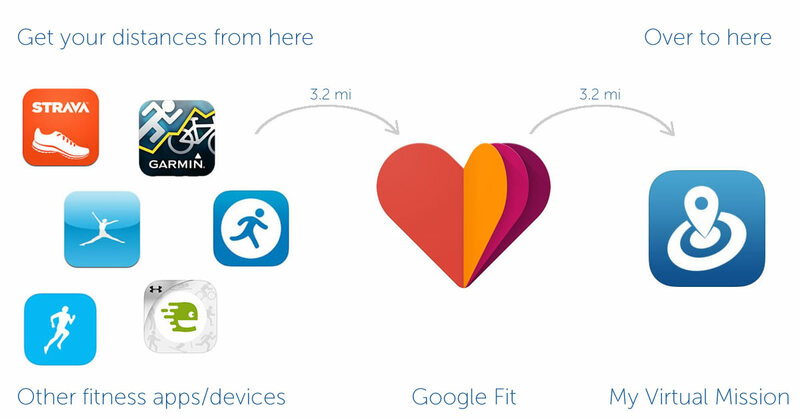 While Google Fit remains in the Android App, we no longer offer support for it. Google Fit can still be used in an “as is where is” manner. We have since built direct connections with other fitness apps such as Runkeeper, Strava, Fitbit and Under Armour. Please note that this new feature is currently still in beta, meaning it might not work exactly as it should! Not that you are lazy or anything, but it would be quite nice to not have to remember to do it manually, right? The latest version of the My Virtual Mission Android app (out now) from v2.2 and up. Upon launching it, it will ask if you want to connect to Google Fit Go ahead and say yes. Connect Google Fit with some other fitness app or wearable device that you want to send distances to MVM (via health) from. e.g. Runkeeper, Strava etc. Usually this is found in the settings page – it could be called “connections” or “link other services” etc. Once you have set that up, any distances that you post to Google Fit from your fitness app or wearable will be sent to your active MVM mission. Enabling the integration will not import distances prior to enabling the integration, only new ones. Fitbit and Google Fit are not friends right now and are having a schoolyard scrap. Fitbit doesn’t (yet) send distance data to Google Fit, but you could do a work around by sending Fitbit data to say Endomondo, which sends it to Google It, which send it to MVM – wow! Only distances from third party fitness trackers (such as Runkeeper Endomondo, Strava etc) will be sent to MVM via Google Fit. We have disabled the native tracking the Google Fit does because it is really clunky. If you skip the Google Fit set up when first opening the app, but then decide you want to enable it, go to the main menu, then settings and then chose integrations. To disable Google Fit, go to main menu, settings and then integrations. Prev:New Feature: Post distances to your mission from other fitness apps and trackers! It would be nice if you put a date on the article. This article says that FitBit and Google Fit are not playing nicely together, but I have no way of knowing if that was yesterday or four years ago and might be resolved! They are currently still not talking to each other as of today (Fitbit and Appple or Google). We are working on a direct integration with Fitbit and will let all users know once it is ready.